Atlanta has the reputation for being a beautiful city for many reasons. One of those is its public art. Sometimes the subject of that art is elegant and beautiful, sometimes it's totally fun and whimsical. 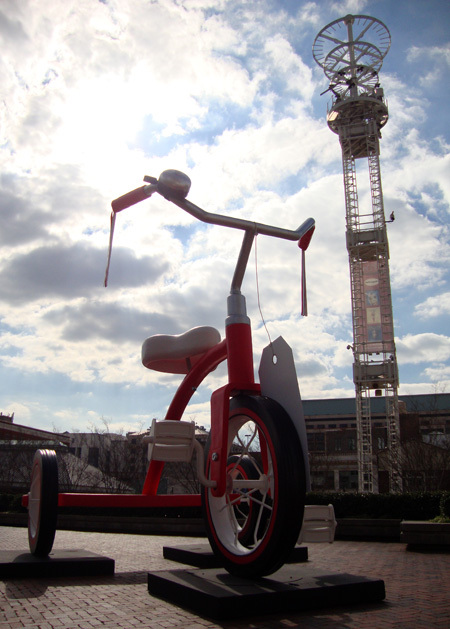 The Giant Tricycle near Underground Atlanta is one of the latter. I was at this location a few weeks ago with a friend visiting from Washington, D.C. We agreed that the tricycle is more than just fun, it's located at a fantastic vantage point. From where I was standing when I took this photo, I could see the tower at Underground Atlanta where on New Year's Eve an 800-pound Peach will descend for a crowd of 175,000 anticipation-filled people to ring in 2011. Also within sight are the golden dome of the Georgia Capitol Building and the Visitor Center of the Atlanta Convention & Visitor's Bureau. I set this Exhibit and it was a great deal of fun. Thanks Atlanta for not trying to take it for a ride.